This example shows how to bootstrap a forward curve using a different curve for discounting. Data is needed for both the forward and discount curve. For this particular example, it is assumed that the data is provided for EONIA (the discount curve) and EURIBOR (the forward curve). However, this approach can be used in any case where the curve to be built is different than the curve used for discounting cash flows. While the data in this example is hardcoded, it could also be imported into MATLAB® with Datafeed Toolbox™ or Database Toolbox™. Build the EONIA curve. This is essentially the same as the single curve case. 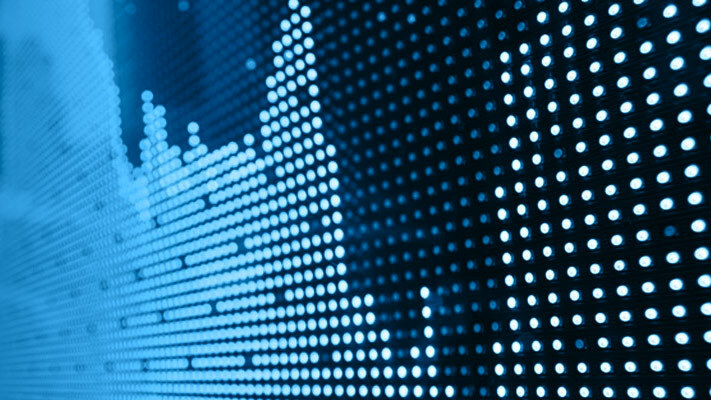 The EURIBOR forward curve is built first using a single curve approach. 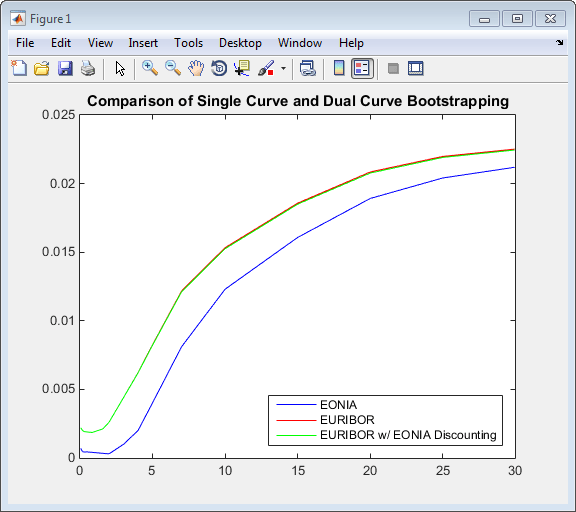 Next, build a curve using the EONIA curve as a discounting curve. To do this, specify the EONIA curve as an optional input argument. Plot the results to compare the curves. As expected, the difference between the two different EURIBOR curves is small but nontrivial. Ametrano, F, and Bianchetti, M.,Everything You Always Wanted to Know About Multiple Interest Rate Curve Bootstrapping but Were Afraid to Ask (April 2, 2013), available at: https://papers.ssrn.com/sol3/papers.cfm?abstract_id=2219548. Bianchetti, M., Two Curves, One Price, Risk Magazine, pages 74–80, August 2010. Fujii, M, Shimada, Y, Takahashi, A.,A Note on Construction of Multiple Swap Curves with and without Collateral (January 2, 2010), CARF Working Paper Series No. CARF-F-154, available at: https://papers.ssrn.com/sol3/papers.cfm?abstract_id=1440633. Mercurio, Fabio, Interest Rates and The Credit Crunch: New Formulas and Market Models (February 5, 2009), Bloomberg Portfolio Research Paper No. 2010-01-FRONTIERS. Nashikkar, A., Understanding OIS Discounting, Barclays Capital Interest Rate Strategy, February 24, 2011.